Coloring books are the current craze, and paper dolls are forever fun. Artist L. Hoerner has combined those two creative pastimes in a brand new whimsical book for you to color and cut out. 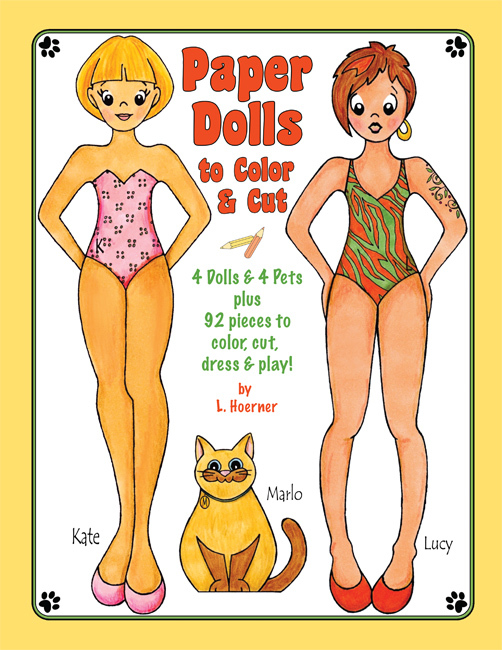 On the covers of Paper Dolls to Color & Cut are four full color dolls, Stella, Jane, Kate and Lucy, along with comical pets. Inside are black-and-white drawings of adorable outfits and accessories for the girls and their pets, too, 92 pieces in all! What fun to choose colors for the dozens of fashion items. See how cute the paper dolls look in their one-of-a-kind multi-colored BY YOU outfits. Model: Color, Cut and Dress!